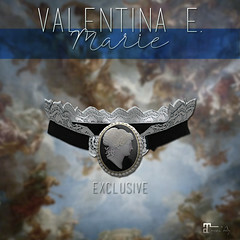 September 2018 – Valentina E.
NEW! 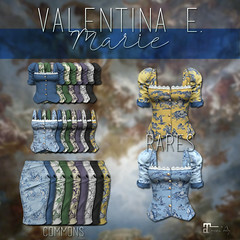 Valentina E. Josie Dress @ Salem! Out now at Salem our new Valentina E. Josie Dress! Inspired by goth and Victorian fashion this charming silk dress features a ruffled bodice, thin neck bowtie and button details. Available in four colors exclusively at Maitreya Lara, only at this special event. Demo available at the event and at our main location. NEW! Valentina E. Karin Ensemble @ Chapter Four! Out now at The Chapter Four our new Valentina E. Karin Ensemble featuring a sumptuous cashmere rollneck sweater and plush leather skirt. Available in four color options, exclusively for Maitreya Lara. NEW! Valentina E. Irina Ensemble @ FaMESHed! Out now at FaMESHed our new Valentina E. Irina Ensemble featuring cashmere sweater, military inspired pea coat, and distressed denim jeans. Available in four color options and a sweater texture change HUD. Belleza, Maitreya, & Slink sizes included. Demos available at our main location and at the event.